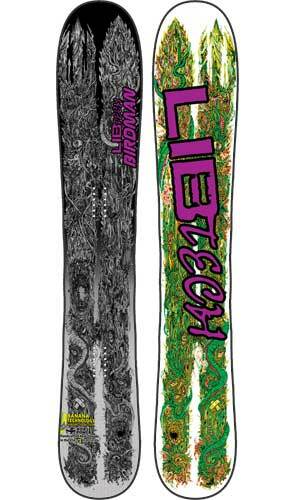 The Lib Tech Birdman has a lot of personality of the discontinued Snow Mullet but with a slightly altered shape and different sizing. The Birdman is one of the most un-sinkable directional powder board out there. There is a massive 4″ (10 cm) set back, decent BTX/Continuous rocker and a massive shovel nose for a very surfy float in very deep powder. The 2015 Lib Tech Birdman changed up the sizing a bit. Before they had a 160, 165, 170 and 180 and this year they dropped the 180. Other than that the board hasn’t changed much but the old review wasn’t that detailed so this year I took it out again and expanded on the 2015 model. Conditions: You could barely call it a powder day. About 4-6 inches of thick sierra snow. Set Up: Set back but not all the way set back. On Snow Feel: It’s pretty loose but not as loose as you would expect. In what little windblown icy patches I had near the top of the mountain weren’t as loose as I thought. Most people won’t take this out on anything but powder and if so you will be in soft snow and it will feel fine. Turn Initiation: This has more of a mid-wide waist and for my size 9 boots I thought it would be a little sluggish edge to edge. However, it seems that the taper, BTX camber profile and set back make it easy to turn. I’d felt fine turning in the trees and where ever I needed to be the board responded. Flex: Not super stiff and it’s pretty playful. I could butter ok with this and it was easy to lean back on the tail and get a little wheelie going. Edge Hold: Grips like a champ and doesn’t feel grabby in the thick crappy powder I had it in. A lot of people have argued that MTX isn’t necessary for powder boards but there have been so many times I’ve had long sketchy windblown icy approaches to a powder-filled chute that I’ve been really glad I’ve had MTX to keep me on edge and feeling comfortable. The more mellow mag near the tip and tail don’t grab and feel more like the .5 mag on a lot of boards these days. 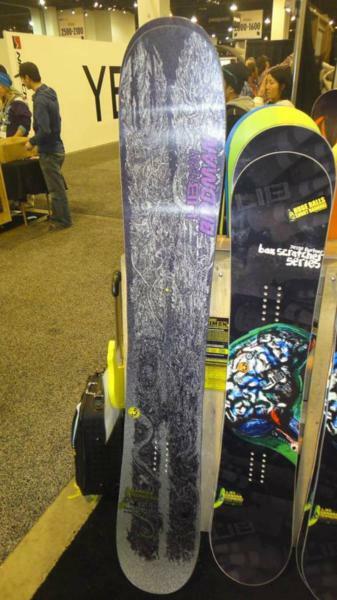 Powder: This board is all about powder and it’s got an amazing directional float. The day I took it out is almost not even considered a powder day but you could see this boards potential. I could lean all the way forward in 6″ of powder without sinking. I found a few little places with wind loading that had deeper snow closer to 1′ but it was only a short patch. The board floated easily with me standing centered on the board. Didn’t even have to lean back. A 4″ set back is crazy far back and this board really rides off the tail. It’s about as surfy as you get. Carving: Nothing entertaining here when it comes to a carve. I wished it had C1 technology like on the La Nina MC so it held a carve a little better. It would make it more fun on those times you have to ride groomers and give it a little more non-powder day appeal too. It would also give a little more pop off the tail to give a little better air. Speed: In powder, you don’t really need a bomber board to go really fast without sketching out and they made this board fine for powder speed. It’s not a board that I’d like to straight line a steep groomer on but it’s fine for straight lining a steep powder-filled chute. Even some chop is fine with this board and it handles it without kicking you around. The base has an easy glide and it keeps its speed well in less steep terrain. Uneven Terrain: Very easy going over bumps and negotiating around bumps. You can still have a lot of fun at the end of a powder day. Switch: I rode it switch here and there and awkward was the first thing that came to mind. Yeah, it’s doable but I feel like if I landed switch in deep powder I’d go over the handlebars. However often times you end up on a groomer on your way back to the chair and it was good enough to ride switch on the groomers. Jumps: There was good pop between the feet but the thought of C1 couldn’t leave my head. It would have been fun to have a little mellow camber in the tail. Still, it really popped whenever I needed it. Jibbing: No attempts to jib. Pipe: No attempts to ride pipe. All in all, this is a really fun easy riding powder board that despite my wish for C1 I really enjoyed. It takes all the work out of a powder day and makes it 100% fun. 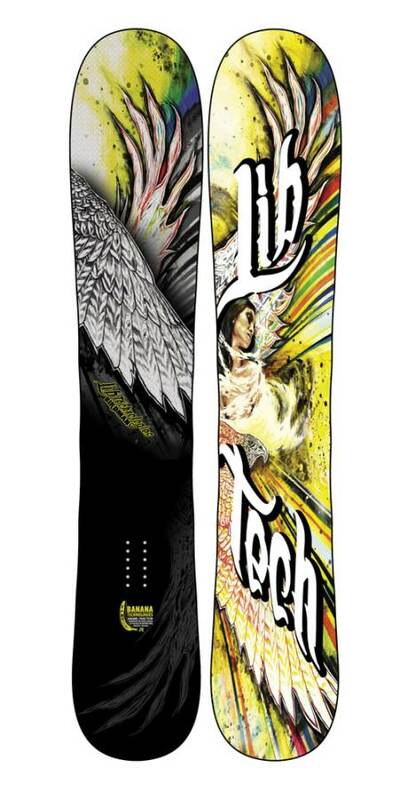 Over the years I’ve come to love a lot of powder boards and the Lib Tech Birdman has joined the list. The 2014 Lib Tech Birdman is pretty similar to the 2013 Birdman except there was a little change to their BTX. There is rocker between the feet and after a little flat to very mild camber. It gives the ride a little more stability but it would be better to see them take the Birdman into Lib Tech La Nina territory with the C1 BTX. That would be a lot more fun but it’s still a bottomless floater. This might have more nose for powder than almost any board out there on the market right now. The only other board that is somewhat close to this is the discontinued Nidecker Legend but they are still somewhat different. They have similar sizing and a directional tapered shape but there are some other differences. The Birdman has a huge set back compared to the Legend. The Legend is only an inch or 2 where the Birdman is 4. The Legend has only a minor taper of .02mm to .05mm depending on the board where the Birdman has a taper of 1.3cm to 1.4cm. The Legend has hybrid camber with more rocker in the nose than the tail and the Birdman is Continuous Rocker with more rocker in the nose than the tail. Both are great in powder but the Birdman gets the nod here and the Legend will get the nod on groomers. Do not be intimidated by the large waist because with this kind of taper the board will turn incredibly easy. 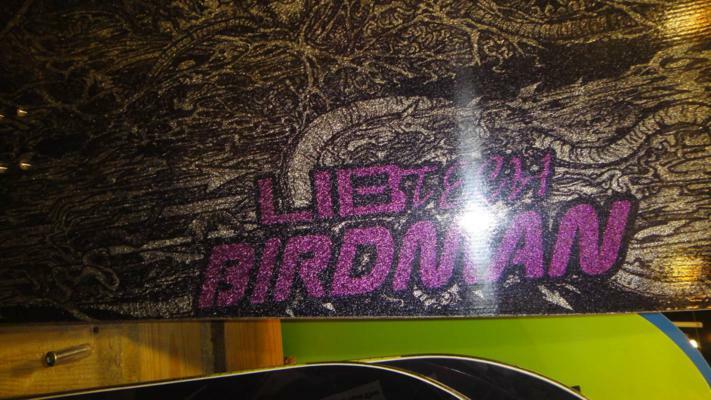 So if you are looking for a board for those waist plus or heli trip powder days the Birdman is going to be your new best friend. If you want to take it out on a groomer it won’t be that bad here either. We would of liked to see C1 on the Birdman but it’s still a great board for what it does. The Birdman is a pure powder board that is made for those deep days where all that matters is keeping afloat. It’s one of those boards that is nearly impossible to sink if you know how to ride well and it’s a very off the tail surfy ride. This is all about powder so that’s really all we are talking about here. We try to get as many images of the Lib Tech Birdman, but forgive us if they're not all there. I used to switch to swallowtail boards when riding sled assisted or heli runs but the Birdman will literally do it all, from ice to groomers to the deepest pow. I first demo'd the board in Andermatt Switzerland on a three foot - fresh day and after riding it had to have it. This is the best board I have ever ridden and I have had 15+ boards over the years. The best pow board I've ever ride. It's incredibly fun, the most floatable board ever. No matter how deep it is, it will float. Awesome surfy feel. I've bem heli skiing twice with this board, and it was Excellent. On the groomer it can carve very well, much better than i expected. I could get good speed as well.